As I first reported on Feb. 3, Real Estate Equities Corporation (REEC) wants to transfer the air rights from the landmarked Hamilton-Holly House at 4 St. Mark's Place to add more floors and square footage to their office building in the works for the northeast corner of Third Avenue and St. Mark's Place. In the first step in this process, REEC reps appeared before CB3's Landmarks Committee on Wednesday night. The committee ultimately voted against the special permit (it was a 2-1 count). This nonbinding vote goes to the full CB3 board on Feb. 26. Three media outlets had reporters at the meeting. You can read the recaps at Curbed ... Gothamist ... and Patch. "I think a number of us are concerned. 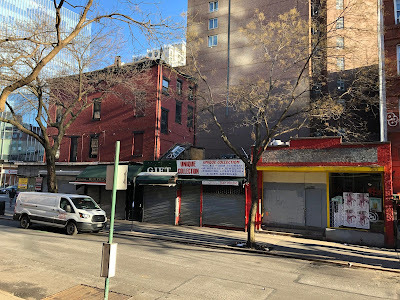 This is the entrance of St. Mark's place which is a really historic street in our neighborhood," said Carolyn Ratcliffe, a member of the board’s landmarks committee, who noted a 19th century apartment building will be demolished and small businesses booted to make way for the new office building. "It's about how we feel about that street and the entrance to that street and it’s like having the whole corner turned into a modern glass [building]." REEC pushed back and said neighborhood advocates are being shortsighted about the deal’s implication’s for the Hamilton-Holly House. “People are talking about preserving the neighborhood and the way it feels but they’re not thinking about the long-term benefits of the preservation of 4 St. Mark’s (the Hamilton-Holly House) going forward simply because people are upset that there might be a building on the corner seems out of spite to want to hurt the individual landmark building,” said Brandon Miller, a managing partner at REEC. Under the approved deal, REEC would pay $4 million for the air rights to Castellan Real Estate Partners, the owner of 4 St. Mark's Place. During the meeting, Miller said the company also contributed $500,000 toward the recent restoration of No. 4. And 5 percent of the air rights sale proceeds — $200,000 — would go into a dedicated account for future maintenance of No. 4. REEC is asking asking the Landmarks Preservation Commission to issue a report to the City Planning Commission to allow for 10-story building. 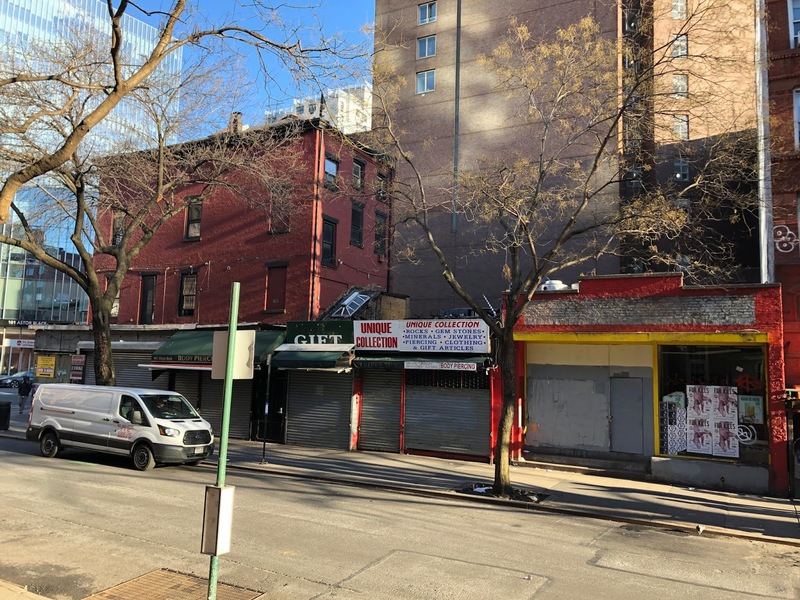 If the LPC gives the greenlight, REEC would then apply for a special permit for around 8,300 square feet of air rights and modify part of the zoning resolution through a special permit. Once in City Planning's hands, the special permit would snake through the Uniform Land Use Review Procedure (ULURP), which is ultimately sent to City Council where the local councilmember, Carlina Rivera, would have a binding vote. Rivera has not yet weighed in, but her spokesman said the councilmember is listening to community feedback. Regardless, REEC already filed permits (last October) for an as-of-right five-story, 29,030-square-foot building on the corner. The full CB3 board meeting is Feb. 26 at 6:30 p.m. Location: P.S. 20, 166 Essex St. (between East Houston and Stanton). IMO, the developers are greedy (yet cheap: 5% to Hamilton Holly House??) SOB's. Just build your 5 stories as-of-right, and stop trying to screw this neighborhood. I hate the architectural vocabulary they've chosen to use, but at least they're acknowledging adjacent tenement heights for fabric continuity and mitigating the garbage dorm height next door. It's a protection racket: "Nice historic building you got here, shame if it wasn't preserved..."
Another ugly soulless building to turn 8th Street into just another street, avenue or boulevard in this City without anything remarkable or special on it. It is a real shame that when they tear down the older buildings they also remove the character and uniqueness of the City.